As with all cameras of this type, particular attention should be paid to results for Color Depth (24.2; average for 4 medium format cameras = 24.1) and Dynamic Range (12.9, average = 12.4). (see “Medium-format camera ranking with respect to the DxOMark Sensor Scale”). 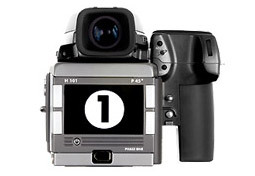 The Phase One P45+ features a very high resolution medium-format CCD with 39.45 Mpix and a 16-bit Analog/Digital (A/D) converter. ISO latitude ranges from ISO 50 to ISO 800, but measurements show that the only two first ISO values (50 and 100) are real, a digital gain is applied during RAW conversion from ISO 200 to ISO 800. The Phase One P45+ shows excellent dynamic range and very good color sensitivity. With respect to its launch date, this result is quite good—only the newer high-end DSLRs show comparable results. Per above, Color Depth is 24.2 bits in print mode. The result is lower in screen mode with a value of 20.8 bits, which means that noise can be observed even at ISO 50 on a larger print (with the same dpi) than the DxOMark reference print (12″ x 8″ print on a 300-dpi printer). Dynamic Range remains at a very acceptable level in screen mode. Another key measurement is ISO Sensitivity. As described above, only the values for the lowest two ISO settings (50 and 100) are real; the other ISO values are achieved by applying a digital gain during RAW conversion. Curves and results for “non-real” ISO are extrapolated and shown with dotted lines on dxomark.com, and the Low-Light ISO value is computed from the extrapolated lines. The Phase One P45+ RAW image quality performance results remain quite good today. Even though some high-end DSLRs are closing the gap in terms of pixel performance, the P45+ very high resolution capability keeps this camera among the few options available for very large size and high-quality professional print photography.